All Mens Wedding Bands can be professionally laser engraved on the inside of the ring. 1. Select the size desired. 2. Then select the engraving option including the font and inscription you desire. 3. Please limit your inscription to 30 words or less. 4. Rings are engraved on the inside. 5. Most engraving can be done in 5-7 days. 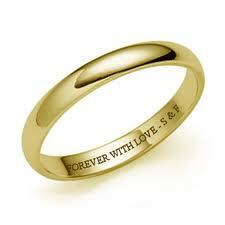 Engraved rings can be exchanged for another style and can also be resized but not returned for a full refund. When choosing a ring from Mens Wedding Bands - make sure you know your exact size even if this means that you have to go into a local jeweler and get sized. Contemporary metal rings (rings made from tungsten carbide, titanium, ceamic, stainless steel, and cobalt) can not be sized ... they must actually be created from scratch in the new ring size you need. That is why once you have engraved the ring we can give you a new one for a small fee once it has been engraved but we cannot give you a refund based upon the factory policies and the policies of Tayloright LLC. However, even if you need a new ring size and the ring has been engraved and even if you want to pick out a new and different ring from our vast selection of online styles - we allow this servic because that is the way we would like to be treated! From time to time a customer will contact us and have a special request for engraving. Maybe they need a specil symbol or wording or font and they ask us if we can accomodate their need. We can literally engrave any ring we sell with any font from WORD which means there are about a hundred or more to choose from - we just offer a few selctions to make it simple. We can also engrave with language in different varities and fonts to meet virtually any need you have. We try and keep engraving to under 40 characters to make the engraving more legible but we can also engrave up to 50 as long as you do not care that the font size is smaller and more difficult to read. If we make a mistake on your engraving, which rearely happens, but if we do we will of course order a new ring and re-engrave at our expense and re-ship it to you at our expense as well. We think that is what we would want to happen should that happen to us and therefore that is how we take care of it. If thi sever happens please let us know ASAP and we will tell you how to ship the ring back to us in a bubble mailer and then we will arrange to have th new ring ordered, engraved and sent back to you in as fast a manner as humanly possible.